Jasbir Singh Mann in his article Debate on Dasam Granth; Issues and Evidence has listed the members of the Sodhak Committee (1897) along with their ‘credentials’. Comparing the name list which JS Mann has prepared with the original list of the members which appears in the Sodhak Committee report it is very evident that JS Mann has intentionally tried to discredit the competence of those who participated in the deliberations. JS Mann has deliberately deleted the information about the academic, linguistic scholarship of most of the individuals. He has also skipped all information regarding the association these members had with various Sikh organizations. Bhai Narain Singh, Persian Scholarand Teacher Government School. Bhai Thakar Singh, Clerk Municipal Committee. Proficient in Persian and Gurmukhi. Has knowledge ofPingal (Science of Poetry) and Raagas. To discredit the competence of the members he has intentionally chosen to highlight their occupation. There are around 24 members listed in the Sodhak Committee report, whereas JS Mann lists only 13 members in his article. In the original Sodhak Committee report 13 members are listed together in the end. JS Mann selectively chose to give only two names from these 13 members based on their occupation. He writes the name of Thakur Singh (Rice Dealer) and Makhan Singh (Sweet Maker) without mentioning their religious associations etc. It is unethical and immoral to mould a historic document in order to prove a hypothesis. Though most of the assertions made by JS Mann in his article are non-historic and are only based on conspiracy theories, this clear tampering with an important document of Sikh history speaks volumes about JS Mann’s actual intent to misinform and mislead. Another important task undertaken by the (Gurmat Granth Parcharak) Sabha was the preparation, at the instance of the Amritsar Singh Sabha, of an authentic recession of the Dasam Granth. Funds for the project were provided by the Sabha secretary, Bhai Manna Singh Hakim, himself. Thirty two different recessions were collected and several prominent scholars and theologians were invited to study them. They met at the Akal Takhat at Amritsar, and held formal discussions in a series of meetings between 13 June 1895 and 16 February 1896. A preliminary report entitled Report Sodhak (revision) Committee Dasam Patshah de Granth Sahib Di was sent to Sikh scholars and institutions, inviting their opinion. A second document, Report Dasam Granth di Sudhai Di was brought out on 11 February 1898. 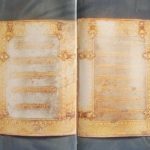 Basing its conclusions on a study of the old handwritten copies of the Dasam Granth preserved at Sri Takht Sahib at Patna and in other Sikh gurudwaras, this report affirmed that the Holy Volume was compiled at Anandpur Sahib in 1698.